Married Name circa 1920 As of circa 1920,her married name was Dhuyvetter. Anna (?) was born circa 1900 at Michigan. She married Cyril Dhuyvetter, son of Charles Dhuyvetter and (?) Wanibeke, circa 1920. Name Variation Helene Buring was also known as Bunte. Name Variation Helene Buring was also known as Helen. Name Variation Helene Buring was also known as Buieny. Name Variation Helene Buring was also known as Helena. Married Name circa 1891 As of circa 1891,her married name was Hanusa. Helene Buring was born on 31 July 1868 at Germany. She was the daughter of Andrew Buring and Susan (?). Helene Buring married Carl W. Hanusa, son of Carl Hanusa and Helene Lickow, circa 1891. Helene Buring died on 10 November 1956 at age 88. Helene Buring had 8 with 7 living in 1910 children. Name Variation Carl W. Hanusa was also known as Charles. Carl W. Hanusa was born on 14 July 1860 at Prussia. He was the son of Carl Hanusa and Helene Lickow. Carl W. Hanusa married Helene Buring, daughter of Andrew Buring and Susan (? ), circa 1891. Carl W. Hanusa died on 28 June 1919 at age 58. [S246] U.S. Federal Census 1880 U.S. Federal Census, by Ancestry.com, Page 22. Dwelling 4. Married Name circa 1863 As of circa 1863,her married name was Buring. Susan (?) was born circa 1839 at Germany also reported as abt 1843. She married Andrew Buring circa 1863. Susan (?) died after 1920. Susan (?) had 2 with 2 living in 1910 children. Andrew Buring was born circa 1831 at Germany. He married Susan (?) circa 1863. Andrew Buring died before 1920. Name Variation Lawrence H. Hanusa was also known as Lorenz. Lawrence H. Hanusa was born on 14 January 1905 at Wisconsin. He was the son of Carl W. Hanusa and Helene Buring. Lawrence H. Hanusa married Florence W. Koepke, daughter of Emil Koepke and Hulda Gaetzke, on 15 February 1931. Lawrence H. Hanusa died on 28 January 2009 at age 104 Lawrence H. Hanusa, 104, formerly of Reedsburg, died on Wednesday, Jan. 28, 2009 at Maplewood Nursing Home in Sauk City. Mr. Hanusa was born on Jan. 14, 1905 in the town of Westfield, Sauk County, the son of Carl and Helen (Buieny) Hanusa. On Feb. 15, 1931, he was married to the former Florence Koepke. Together they farmed in the Lime Ridge and Loganville area until moving to Reedsburg in 1959. He then drove truck for various businesses. He was a member of St. John's Lutheran Church in Loganville and was a member and past president of the Reedsburg Senior Citizens. He served as tour director for the senior citizens for five years and was also a volunteer driver for seven years. He enjoyed playing cards, fishing and dancing. Mr. Hanusa is survived by three children, Leonard (Merry Ann) Hanusa, of Reedsburg, Gloria (Alvin) Moles, of Prairie du Sac and Larry (Betsy) Hanusa, of Bothell, Wash; nine grandchildren: Jim (Betty) Kruse, of Madison, Joel (Jackie) Kruse, of Arena, Jerry (Dawn) Kruse, of North Freedom, Jerome (Nancy) Kruse, of Portage, Paul (Mary Ellen) Hanusa, of Austin, Texas, Cheri (Chuck) Stephens, of Oregon, Sara (Jonathan) Johnson-Watts, of England, Brian Hanusa, of Bothell, Wash. and Jim Hanusa, of San Francisco, Calif; 19 great-grandchildren; one great-great-grandson; nieces and nephews; other relatives and friends. He was preceded in death by his wife, Florence, on April 12, 2002; five brothers: Edward, Ted, Carl, George and Henry; and one sister: Elsie Meyer. Funeral services were conducted Feb. 1 at St. John's Lutheran Church in Loganville with Rev. Duane Daeke officiating. Interment was in the St. John's Cemetery. In lieu of flowers, memorials to St. John's Lutheran Church or Maplewood Nursing Home would be appreciated. Lawrence H. Hanusa obtained US Social Security Card at Wisconsin; last residence Reedsburg, Sauk, Wisconsin. George E. Hanusa was born on 27 December 1907 at Wisconsin. George E. Hanusa died in February 1978 at age 70. George E. Hanusa obtained US Social Security Card at Wisconsin; last residence Reedsburg, Sauk, Wisconsin. Henry H. Hanusa married Elvador D. (?). Henry H. Hanusa was born on 9 December 1909 at Wisconsin. Henry H. Hanusa died in August 1987 at age 77. Henry H. Hanusa obtained US Social Security Card at Wisconsin; last residence Loganville, Sauk, Wisconsin. Edward Henry Hanusa was born on 4 November 1891 at Wisconsin. Edward Henry Hanusa married Clara Pauline Terasa circa 1917. Edward Henry Hanusa died on 24 November 1978 at Reedsburg, Sauk, Wisconsin, at age 87. Edward Henry Hanusa obtained US Social Security Card at Wisconsin; last residence Reedsburg, Sauk, Wisconsin. Name Variation Theodore A. Hanusa was also known as Ted. Name Variation Theodore A. Hanusa was also known as Theo. Theodore A. Hanusa was born on 31 December 1893 at Sauk, Wisconsin. Theodore A. Hanusa married Alma Peters, daughter of Charles Peters and Katie Blumstien, before 1919. Theodore A. Hanusa died before February 2009. 1 January 1925 Council Bluffs Ward 1, Pottawattamie, Iowa Theodore A. Hanusa appeared on the census of 1 January 1925 at Council Bluffs Ward 1, Pottawattamie, Iowa. Married Name 23 November 1919 As of 23 November 1919,her married name was Meyer. Elsie Amanda Hanusa was born on 27 October 1896 at Sauk, Wisconsin. She was the daughter of Carl W. Hanusa and Helene Buring. Elsie Amanda Hanusa died on 8 June 1936 at Sauk, Wisconsin, at age 39. Married Name Her married name was Hanusa. Elvador D. (?) married Henry H. Hanusa, son of Carl W. Hanusa and Helene Buring. Elvador D. (?) was born on 1 January 1920. She died on 13 April 1963 at age 43. Name Variation Carl Hanusa was also known as Karl. Carl Hanusa married Helene Lickow. Carl Hanusa was born on 9 May 1827 at Prussia. He died on 15 January 1889 at Franklin, Sauk, Wisconsin, at age 61 also reported as 09 Jan 1889. His estate was probated on 2 December 1889 at Sauk, Wisconsin. Name Variation Helene Lickow was also known as Lena. Helene Lickow married Carl Hanusa. Helene Lickow was born on 4 July 1835 at Prussia. She died on 22 June 1923 at age 87. Name Variation Gustave Adolf Hanusa was also known as August. Name Variation Gustave Adolf Hanusa was also known as Gustav. Gustave Adolf Hanusa was born in 1857 at Prussia. Gustave Adolf Hanusa died in 1927. Henriette Hanusa was born circa 1856 at Prussia. She was the daughter of Carl Hanusa and Helene Lickow. Mary Hanusa was born circa 1862 at Prussia. Henry Hanusa was born on 11 October 1866 at Prussia. Henry Hanusa married Susanna Wincher, daughter of (?) Wincher, on 2 July 1890. Henry Hanusa died on 7 March 1923 at age 56 Henry Hanusa died at his home in Houghtonburg at 11 o'clock Wednesday morning, after a long illness. Funeral is held this Friday afternoon and burial will be in the Alma Center Cemetery. On the 11th day of Oct. 1866 Mr. Henry Hanusa was born in Schessieh, Germany. Twelve eyars later his father moved to this country and settled in Leland, Sauk Co., Wis. There he was instructed in the chief parts of Christian doctrine and at his confirmation, renewed the pledge he had taken at baptism and promised allegiance to the Evangelical Lutheran Church. By the power and grace of God he was redeemed that promise, and has set a worthy example to all. He entered the holy bonds of matrimony with Miss Susanna Winscher, July 2, 1890. This union was blessed with three sons and five daughters, all living: Mrs. Ervin Kelsh, Alma Center; Mrs. Frank Schabel, Dutton, Mont; Miss Nellie, Will, alma Center; Mrs. A. H. Yakes, Lake Geneva; Emil, Arnold, and Elva, all of Alma Center. These can best testify to the earnest Christian rearing and training which he bestowed upon them. His beloved wife, the children, seven grandchildren, one brother, and three sisters are deeply saddened by his departure, but hold fast with the deceased his hope of a reunion in heavenly mansions. The span of life allotted to our sainted brother was 56 years, 4 months and 27 days. According to the wisdom of God the last cross of sickness was laid upon him about fourteen months ago. Pain and suffering were the jagged edges of his cross; still he confessed himself a sinner with deep sincerity, and kept a close communion with his Savior and friends, in whose blood he trusted implicitly for his full salvation. The word of God and prayer were wielded as steadily and sturdily by him as arms of war are wielded by soldier of valor, his deep appreciation of the 27th Psalm will long linger in the memory of the bereaved. The German hymns No's. 298 and 430, his own choice, will offer much consolation. It was the wish of Mr. Hanusa that his obituary be permeated with a confession of the faith that was in him, and so a Christian life, lived in the faith of the Son of God, has left an excellent monument to his memory. The funeral services were conducted from the Ev. Lutheran Grace Church of Alma Center, Friday afternoon, March 9, and interment made in the Alma Center Cemetery. The Rev. F. J. Geske of Fairchild, delivered a German funeral address, and the Rev. Henry Mueller officiated in the English language. Relatives from away who attended the services were: Mr. and Mrs. Gustav Hanusa, Mr. and Mrs. A. Gergolla, Plain; Mrs. Carl Hanusa, Logansville; Mr. and Mr. J. Heinilich, Merrimac; Mrs. Theresa, Madison; John and Gottlieb Wawrock, Denzer. Name Variation Helena Hanusa was also known as Lena. Married Name circa 1889 As of circa 1889,her married name was Gargola. Married Name circa 1889 As of circa 1889,her married name was Gargolla. Helena Hanusa was born in May 1869 at Prussia. Helena Hanusa married Adolph Gargolla circa 1889. Anna Hanusa was born circa 1871 at Prussia. Name Variation Alvine Hanusa was also known as Mina. Alvine Hanusa was born circa 1876 at Wisconsin. George Hanusa was born circa April 1880 at Wisconsin. George Hanusa died before 1889. Name Variation Susanna Wincher was also known as Winscher. Name Variation Susanna Wincher was also known as Susan. Married Name 2 July 1890 As of 2 July 1890,her married name was Hanusa. Susanna Wincher was born on 14 March 1871 at Prussia. She was the daughter of (?) Wincher. Susanna Wincher married Henry Hanusa, son of Carl Hanusa and Helene Lickow, on 2 July 1890. Susanna Wincher died on 6 October 1929 at age 58 Susan Wincher was born in Kunstadt, Germany, on March 14, 1871. 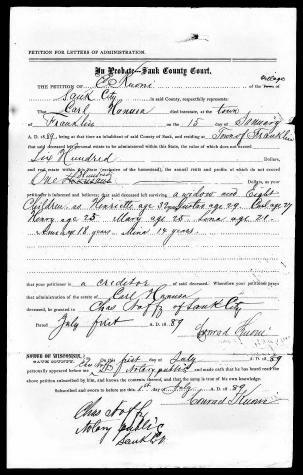 When she was fourteen years of age her parents immigrated to America and settled near Leland, Sauk County, Wis. On July 2, 1890, she was united in marriage with Mr. Henry Hanusa. To this union were born eight children: Mrs. Dora Kelsh of Humbird, Mrs. Frank Schabel and Mrs. Frank Lock of Dutton, Mont., Will and Emil of Chicago, Mrs. Mae H. Yakes who preceded her in death trhee years ago, Arnold of Chateau, Mont., and Elva at home with her sister, Mrs. Kelsh. During the first twelve years of their married life, Mr. and Mrs. Hanusa lived in Sauk County, and in 1902 they moved to Jackson County, where they have since resided. Mr. Hanusa passed away in 1923, and since that time Mrs. Hanusa’s health gradually failed. The past three years she had been under the doctors and nurses care, but nothing seemed to be a relief to her suffering. On Oct. 27, 1928, she was brought from a diabetic sanatorium at West Bend to the sanatorium and Onalaska, where she was a patient until Oct. 6, 1929, where, by the will of God she was relieved and called to rest. She leaves to mourn her death, besides her children, two brothers, Gottlieb and Charles Wincher, and one sister, Mrs. George Galster. Funeral services were held at the Grace Evangelical Church at Alma Center Wednesday afternoon, Rev. Munderloh officiating. Interment in the East Lawn Cemetery. Those from away who attended the funeral were Mr. and Mrs. Will Hanusa, Mr. and Mrs. Emil Hanusa, and Mrs. Maude Malchow of Chicago; Arnold Hanusa from Chateau, Mont; Mr. and Mrs. Adolph Gergolia and son Edward, R.C. Schwaner, and Mrs. Lena Hanusa from Logansville; Mrs. Geo. Welfel and son Marvin from Racine, Mrs. John Hemlich and daughter Emma from Merrimac; Mr. and Mrs. Funk from Augusta. Name Variation Dora L. Hanusa was also known as Dolly. Name Variation Dora L. Hanusa was also known as Dover. Married Name Her married name was Kelsh. 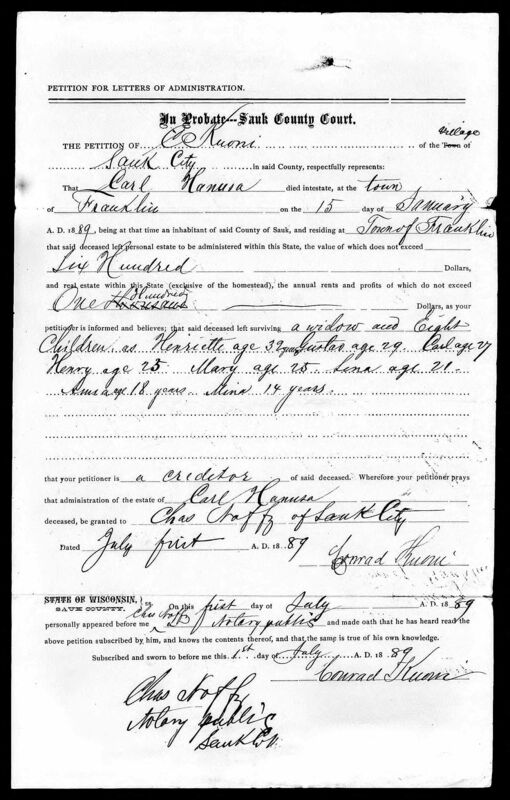 Dora L. Hanusa married Ervin J. Kelsh. Dora L. Hanusa was born circa 1892 at Wisconsin. She was the daughter of Henry Hanusa and Susanna Wincher. Ervin J. Kelsh married Dora L. Hanusa, daughter of Henry Hanusa and Susanna Wincher. Ervin J. Kelsh was born circa 1894 at Wisconsin. Married Name Her married name was Lock. Married Name Her married name was Schabel. Julia Hanusa was born circa 1894 at Wisconsin. Nellie Hanusa was born circa 1896 at Wisconsin. Name Variation William Hanusa was also known as Will. William Hanusa was born circa 1901 at Wisconsin. He was the son of Henry Hanusa and Susanna Wincher. Name Variation Mae Hanusa was also known as Mary A. Married Name Her married name was Yakes. Mae Hanusa was born circa 1903 at Wisconsin. Mae Hanusa died circa 1926. Emil Hanusa was born circa 1906 at Wisconsin.